This is a fast paced drill that involves shooting, boxing out and quick decisions – on top of the full court attack skills of the Dribble Drive. I really like it because it incorporates all of the dribble drive skills in the full court, but at the same time you have to focus on rebounding, aggressiveness and make quick decisions. Full c ourt drill. Two lines under the basket. Balls in one line. Players switch lines every time they’ve been in the drill. O1 passes the ball to O2. O1 then sprints over to O2 and taps the ball before he backpedals to his shooting range. O2 passes the ball to O1 for a shot. A made shot is worth one point. The defender O 2 now boxes out and the two players fight for the rebound. Whichever player gets the ball is attacking to the other end. Points are awarded for making a basket. Next team goes when the rebound is secured. This makes the drill move very quickly. 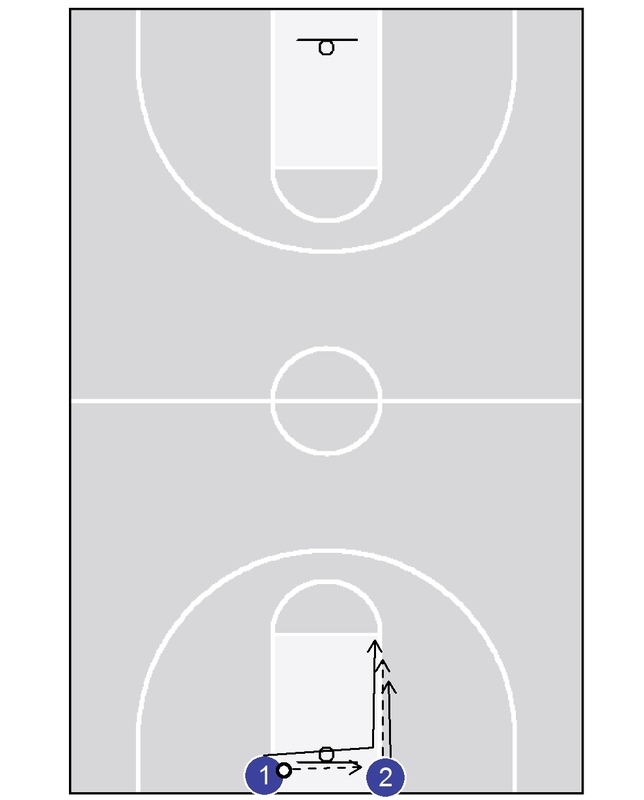 You may vary the court size for this drill. If you want to make it difficult you limit the players to the space betseen the lanes. This forces the players to really attack to go by the defender.